HP’s little bid in the big smartphone market, the HP Veer, has been enjoying its presence on the market for a while now, but a little boost from commercials never hurts. Unless it features eight-division world champion in boxing Manny Pacquiao. That might be the exact kind of eloquence the miniature handset needs as it faces some tough and bigger competitors. The HP Veer might not get the stellar supporting cast for the HP TouchPad including celebrities like Lady Gaga, Kanye West and Jay-Z, but it’s nevertheless an interesting little QWERTY slider. It’s small 2.6-inch screen however is sufficient for most of the functionalities of webOS, including some sports tracking features demoed by Pacquiao. Check out the video below, but if you’re not yet convinced why don’t you head to our review of the HP Veer detailing all of its pros and cons. 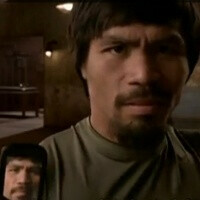 Good commercial real good...go Pac Man!! it is floyd.....and pac man was ducking mayweather he turned down 2 fight terms and contracts to mayweathers one at the time mayweather was pound for pound numebr one the onyl reason why pac man got it was because he stop fighting i like pacman but hes just no technical enough for floyd....and you say he never fought anybody in there prime who has pac man fought in their prime??? ?